Leaders of the largest U.S. companies are becoming more optimistic about sales growth, hiring and capital investment, causing a measure of chief-executive sentiment to increase by the most in seven years. 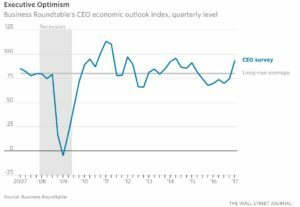 The Business Roundtable CEO Economic Outlook Index rose 19.1 points in the first quarter from the fourth quarter, to reach 93.3, according to a survey released Tuesday. It was the largest one-quarter gain for the index since the fourth quarter of 2009, when the economy was just emerging from the recession. Readings above 50 indicate economic expansion. Other sentiment measures have also jumped following President Donald Trump’s election in November. The University of Michigan’s consumer-sentiment index rose to the highest level since 2004, though it edged down in February. The National Federation of Independent Business’s Small Business Optimism Index also touched the highest level since 2004 early this year, before falling slightly in February as well. Mr. Trump has pledged to cut regulations and taxes, and to boost American employment. Hiring picked up in January and February to levels consistent with gains during 2014 and 2015, after a fall slowdown, according to Labor Department data. However, most economists don’t forecast a near-term acceleration in overall economic growth. The Federal Reserve Bank of Atlanta’s GDPNow model last week estimated first-quarter growth at a 1.2% pace. That’s weaker than the overall expansion’s roughly 2% annual pace. The Roundtable survey showed CEOs upgraded their forecast for 2017 economic growth to a 2.2% increase, from the 2% gain forecast in December. The CEOs don’t offer a longer-run projection, but Mr. Dimon said growth could accelerate. The current expansion’s average annual growth has been the weakest of any since at least World War II. 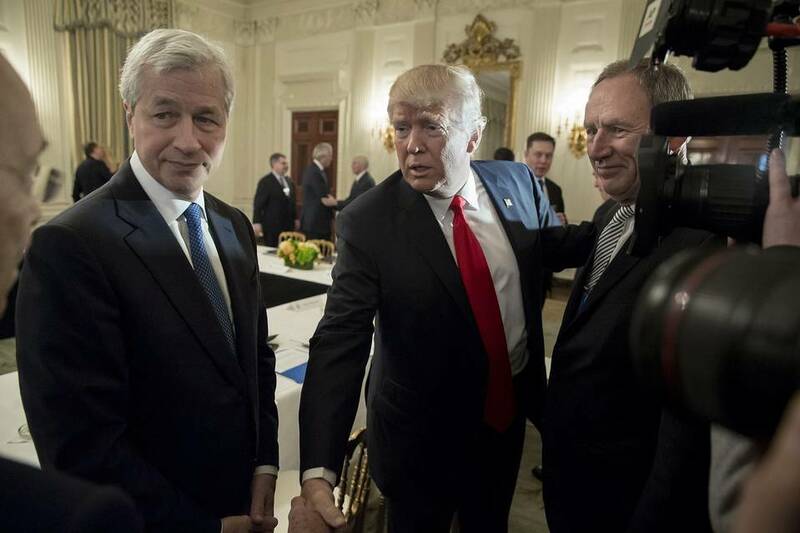 The CEOs listed tax reform, reduced regulations and infrastructure spending as the top three priorities for the Trump administration and Congress. The organization hopes Washington lawmakers will seize upon a “once-in-a-generation” chance to overhaul the tax code. Mr. Dimon isn’t concerned that higher interest rates could slow growth. The Federal Reserve is expected to raise its benchmark rate at a meeting this week. A rate increase is a “sign of strength, not a sign of weakness,” he said. The Roundtable survey showed the CEO outlook index was at the highest level since the second quarter of 2014. This quarter also marked the first time in seven quarters the gauge rose above its long-term historical average. The survey showed 41% of CEOs expect to increase hiring at their firms in the next six months, up from 35% in the prior quarter’s survey. And 46% plan to boost capital spending, also up from 35% in the December reading. The survey of 141 chief executives at large U.S. businesses was conducted between Feb. 8 and March 1.